Start a Free 14-Day Trial Now! 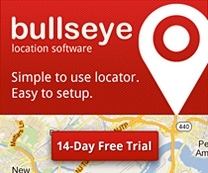 Bullseye Locations is a hosted cloud provider of store locator, dealer locator and location-based CMS solutions. Founded in 1998, the company is now host to over 3000 clients from retailers to manufacturers. Learn more at the Bullseye Locations website.